The International and European Federations of Journalists (IFJ and EFJ) today joined a global call for the EU to take action to protect journalists and end impunity within Europe. The IFJ and EFJ cosigned a letter with 15 media freedom organisations addressed to the President of the European Commission, Jean-Claude Juncker, calling for EU action to protect journalists in Europe following the recent killings of Slovak and Maltese reporters Jan Kuciak and Daphne Caruana Galizia. The killings of the journalists, who had reported on corruption, organised crime and the abuse of power in their respective countries, are “unacceptable”, says the letter. Despite welcoming the EU’s moves to condemn the killings the group demanded that words are followed by action. “Safety of journalists is a precondition for good journalism that serves the societies and audiences. Our European democracies cannot thrive when journalists are silenced and cannot inform people about important developments and hold power holders to account,” reads the letter. 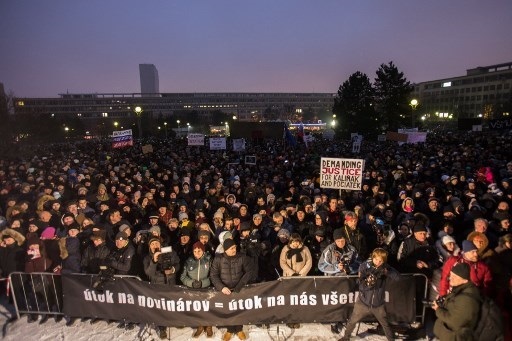 The coalition has urged high-level officials from the European Commission to retain regular communication with senior police authorities in Slovakia and Malta to ensure that police investigations are full, thorough and independent as a measure to fight the high rates of impunity in a world where a journalist is killed every five days with almost full impunity. It has also called on the European Commission to work with Member States to begin the process of establishing national protection mechanisms for journalists in Europe and to implement their existing commitments to provide a safe environment for journalists, flowing from numerous adopted United Nations resolutions on the matter as well as the Council of Europe recommendation on the Protection of Journalism and the Safety of Journalists And Other Media Actors. Article 19, Committee to Protect Journalists (CPJ), European Centre for Press and Media Freedom (ECPMF), Free Press Unlimited, The European Journalism Centre (EJC), Rory Peck Trust, Transparency International EU, Index on Censorship, the International Press Institute (IPI), IFEX , Reporters Without Borders (RSF) and Global Forum for Media Development (GFMD), among others, have also cosigned the joint open letter to Mr Jean-Claude Juncker. Picture credit: Alex Halada /AFP.